If Mary ’04 and Clark ’05 Maxwell had a checklist that outlined their dream school, Texas A&M University at Galveston would check off all the boxes. Like many Aggies by the sea, they were drawn to Texas A&M University’s sister campus for the smaller classroom sizes and a stronger emphasis on maritime learning. Because of their positive college experiences, the Maxwells created two planned gifts to support students and athletes at their alma mater. 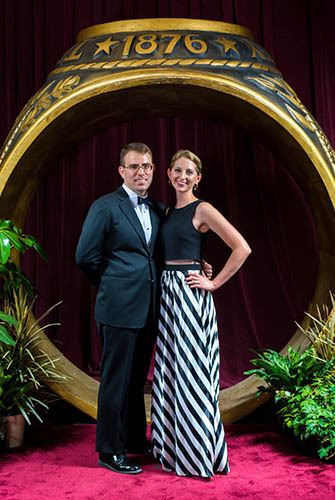 Mary '04 and Clark '05 Maxwell both decided to support Texas A&M Galveston through gifts in their will, each supporting aspects of their education that impacted them the most. Texas A&M Galveston is the main source of ocean-oriented programs at Texas A&M, specializing in maritime courses in science, business, engineering, liberal arts and transportation. Its location offers easy access to the ocean and hands-on learning experiences for students. The campus is also home to one of six maritime academies in the United States, the Texas A&M Maritime Academy, which provides students with professional training to serve on oceangoing and inland waterways vessels for the United States Coast Guard. Mary grew up watching her father serve in the Coast Guard, and the experiences and stories she heard from his time at sea inspired her to choose Texas A&M Galveston. Four years later, she graduated with a bachelor’s degree in maritime administration. These days, she works as a surveyor for the American Bureau of Shipping, an organization that provides classification services for marine and offshore industries. Founded in 1997, Aggie Crew is the official rowing team at the Galveston campus. The organization has since expanded and now competes in tournaments across Texas and the southern United States. Mary served as an officer for two years, and her dedication to Aggie Crew inspired her to give back to the team that shaped her college experience. She created an endowment that will support the ongoing operations and expenses of both Aggie Crew and Texas A&M Crew, the sister team at Texas A&M’s College Station campus. “I hope my gift will make rowing a more popular and valued sport at both schools,” she said. After creating Mary’s gift, the couple wasn’t done. Clark created an endowed scholarship for students pursuing degrees in marine engineering technology or marine engineering. His scholarship fund will provide financial assistance to juniors and seniors in the Texas A&M Maritime Academy and is intended for students who exhibit campus involvement. A former member of the Offshore Sailing Team and Maritime Academy, Clark wants to give back to students who obtain an out-of-classroom education. Clark received his bachelor’s degree in marine engineering technology in 2005 and later earned a master’s degree in business administration from Texas A&M’s main campus. He now serves as a marine technical adviser at Motiva Enterprises in Houston, Texas. Both Mary and Clark created their gifts through charitable bequests in their wills. The process is easy: To make a bequest, an individual simply designates a gift be made to the Foundation as part of his or her estate plan. Benefits include the ability to retain assets during your lifetime, lessen the burden of taxes on your family and support Texas A&M in whatever capacity you choose, whether it be a program, department, faculty member, or student scholarship or organization. The Maxwells found their own piece of Aggieland in Galveston Bay—one that provided them with a close-knit community and memorable leadership experiences. Now, their legacies will forever be cemented at the place they once called home. HAVE YOU CREATED A GIFT IN YOUR WILL? LET US KNOW!